This is a guest post by Trent Hunter, author of Joshua: A 12-Week Study, which is part of the Knowing the Bible series. The following article was taken from Crossway.org. Used by permission. 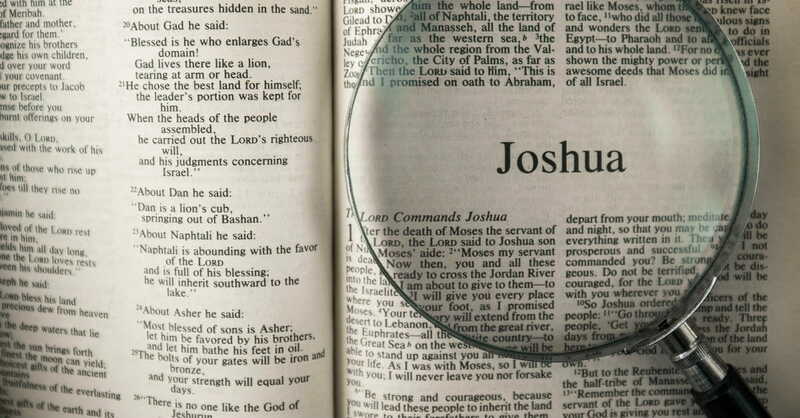 Why should we study the book of Joshua? The best answers to that question will come when we understand why God gave us this book. Why does God want us to study the book of Joshua? That’s the crucial question. There are a number of strategies for discerning why God gave us a particular book of the Bible: the book’s structure, repeated lines, and how the New Testament reflects on the book, are three examples. Using these three strategies, here are three reasons to read Joshua. God promised Abraham that his children would inherit Canaan, a land filled with inhabitants, armies, and fortified cities. But how exactly does Israel get from wandering in the wilderness to settled in their land? The book of Joshua tells this story. The book’s opening scene is tense. Moses is dead. But the promise of salvation is very much alive. The Lord commands Joshua to take his people across the Jordan and into the land, promising success wherever he goes so long as he and the people keep the Lord’s Word. When the book ends, Joshua is dead and buried in his inheritance. In between is a story of Joshua’s courage and conquest as he leads the people into the land. The book’s structure makes this emphasis clear: crossing into the land (ch. 1–5), taking the land (ch. 6–12), dividing the land (ch. 13–21), and serving the Lord in the land (ch. 22–24). Centered on this move into the land, the story of Joshua orients us to the stage on which so much of the rest of the Bible will play out. But more than a place, the land is a pattern. The land is a pattern that looks back to Eden. In fact, many times over in the Bible the land of Canaan is referred to as “like the garden of Eden” (Gen. 13:10; Isa. 51:3; Ezek. 36:35; Joel 2:3). The land also looks forward to the greater inheritance of the new creation. This is why Abraham, who received the promise of land, nevertheless, “desired a better country, that is, a heavenly one” (Heb. 11:16). This is the ultimate inheritance to which the story of Joshua subtly points when, for example, the Levites are left out of the land assignments, for “the Lord God of Israel is their inheritance” (Josh. 13:33). One more thing about Israel’s move into the land. Why did it require the slaughter of the land’s inhabitants? This question presents sensitive readers with understandable difficulty. Understanding the land in light of the whole Bible helps us here. Humans were banished from Eden because of sin, and there won’t be any sin in the new creation. The land is a taste of that perfection to come. The obedience and purity required for Israel to dwell with God in the land teaches us about what is required for man to dwell with God anywhere. We should read the book of Joshua for the geography of the Bible’s story. Even more importantly, for one stop on the Bible’s map to heaven. But given human sinfulness, how could ultimate salvation ever be possible? After all, by the close of Joshua there are still inhabitants in the land, and later in the Bible’s story even Israel will be ejected due to unbelief. This leads us to our second reason for reading Joshua. Tucked away in the twenty-first chapter of Joshua is an astonishing summary of the book: “Thus the Lord gave to Israel all the land that he swore to give to their fathers. And they took possession of it, and they settled there” (21:43). The key words in this sentence—give and gave—are repeated throughout the book. For example, at the head of the book, the Lord commands Joshua to cross the Jordan “into the land that I am giving to them,” the land that “I have given to you,” the land which he “swore to their fathers to give to them” (1:2, 3, 6). Within the context of God’s covenant with Israel established through Moses, obedience was required for the blessing God promised. This requirement is reinforced clearly in the book of Joshua (1:7–8). Joshua and the people were to obey the Lord, and when they did the Lord promised to bless them with victory. The Lord gave his people instructions for battle at Jericho that confounded military wisdom and proved that he indeed fights for them. The Lord stopped the sun and threw hail at Israel’s enemies. Conversely, if they disobeyed the Lord, the Lord promised to curse them. This is why Jericho fell to Israel in one chapter, and why Israel fell to Ai in the next (Joshua 6, 7). Nevertheless, the land is not earned by Joshua and the people. The land is given by the Lord, and it is given in fulfillment of God’s promise made to Abraham. This insight into God’s unfailing character is an important theological takeaway from the book of Joshua—a take away which helps us understand our dependence upon the Lord for our own salvation. As we watch God meticulously keep his promises, both in blessing for obedience and in cursing for disobedience, we are reminded that he keeps his new covenant promises just as well. But in the new covenant God has given a perfectly obedient covenant mediator—a savior greater than Joshua to lead us into a salvation greater than Canaan. How can any man do this? This divine-human savior takes the curses we deserve for our disobedience, and he gives us the blessing he earns by his. The story of Joshua contributes to the tension within the Old Testament storyline that leads us to the good news of this savior and his victorious cross and resurrection. And so we should read the book of Joshua in order to behold the Lord who makes great promises and who keeps every promise he makes. But who is this salvation for? This question leads us to our third reason for reading Joshua. There is much good news for sinners in the book of Joshua. Just as he promised, the Lord carved out a place to dwell with his people. Just as he promised, he did this through a great leader and son of Abraham. Just as he promised, his people multiplied and they flourished. But there’s more good news in the story of Joshua yet. And this is where it gets personal for sinners like you and me. In this story we see the blessing of Abraham come to the nations. This happens in beautiful and surprising ways. Behind the walls of fortified and hardened Jericho is a Gentile prostitute who believes that the Lord is the God of heaven who has given Israel the land (Joshua 2). She believes and is saved. When the land is divided, the first person to receive an inheritance is Caleb, a Kenizzite, whose people were formerly Gentiles (Josh. 14:13; Gen. 15:19). They believed and are counted among God’s people. Then, along the way, the Gentile Gibeonites make a covenant with Joshua, albeit in a sneaky way, and get in on God’s promises as well (Joshua 9). They believed their only safety would be found with Israel’s God and they were saved. So, what are we to do? As we read the book of Joshua, we take our cues from the New Testament authors, who commended the faith of people like Rahab, and praise God for bringing salvation all the way to us (Heb. 11:31; James 2:25). By giving the land, the Lord shows us the kind of salvation he brings. By keeping his covenant promises through Joshua, the Lord shows us the kind of savior he provides. By saving Gentiles by faith, the Lord shows us the kind of people he saves. There are other reasons, but these are the best reasons to open, to read, and to study the book of Joshua. Trent Hunter (MDiv, The Southern Baptist Theological Seminary) serves as pastor for administration and teaching at Desert Springs Church in Albuquerque, New Mexico. He is a regular contributor to the Gospel Coalition and is the author of Graphical Greek: A Quick Reference Guide for Biblical Greek. He is also an instructor for the Simeon Trust Workshops on Biblical Exposition. He is married to Kristi and they have three children.